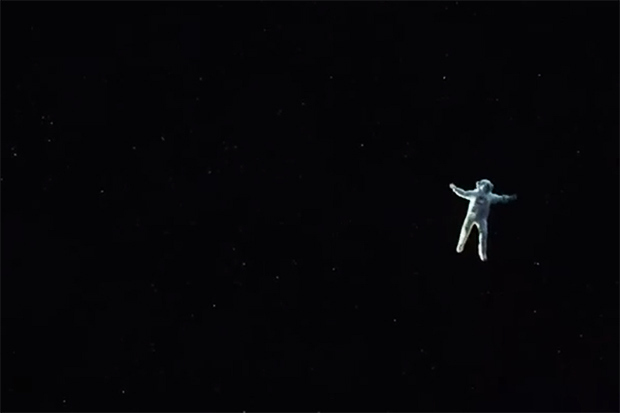 “Just when you thought it was safe to go back in space…,” a terrifying movie like “Gravity” hits you in the face. “Gravity” is one of those films that’s truly an experience that one undergoes: one of the tensest time periods ever spent in a cinema. This is an extremely uncomfortable film. Space is the new deep water or haunted house or Bates Motel or forest or woodshed, with the dazzling fear of becoming U-N-T-E-T-H-E-R-E-D and floating off into the dark forever just one mishap away. “Gravity” is one of those films you have to see for yourself, and I hate to give away even the barest of plots, but here goes. Dr. Ryan Stone (the always “stellar” Sandra Bullock) is a second-career astronaut floating around fixing something up there with the incredibly seasoned (this is his last mission) Matt Kowalski (a chipper George Clooney). Everything is more or less going well until those Ruskies (who else?) do something stupid to compromise the Americans’ mission. Didn’t they get the memo? Once again, the Russians are simply our favorite frenemies, and, let’s face it: we miss the Cold War. Good times, good times. But back to our plot. No, not back to our plot. That’s all I’m going to tell you. Please try to see this in theaters. I saw it in REAL 3D (excellent use of 3D, which should be used sparsely). It’s true what audiences are saying: “It’s like you’re up there with them.” Or get the full experience with IMAX digital 3D. Is it all that? Yes and no. Could someone else have taken our big-time female protagonist’s place other than Bullock? Maybe. Oscar material? Maybe (certainly for cinematography, visual effects and audio). Some of it really did feel like “we’ve heard this sob story before,” and the orchestral soundtrack was rather noticeably cloying at times. Would this same story have “flown” if it were anywhere else but space? As exciting and groundbreaking as this film is—several years in the making—and a great movie-going delight, I’m still holding out for Cate Blanchett (“Blue Jasmine”) for Best Actress as of this moment. Next Article Did You Run Out of Sins?